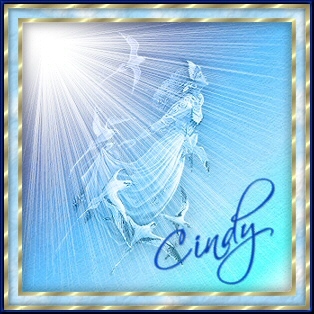 See 2 more done by Cindy below. Angel Tube of your choice or get the one I used HERE. I do not know the origin of this tube. I received it through a group to which I belong. If it is yours, please let me know so that I can acknowledge your authorship. This is a "quickie". If you are not familiar with the tools in PSP8 this may be difficult to follow. Open a new image 300 X 300, raster background, 16 million colors, transparent. Flood Fill with the color you want to use. I used #2C7DD8 light blue. Then Click OK This is the background image. 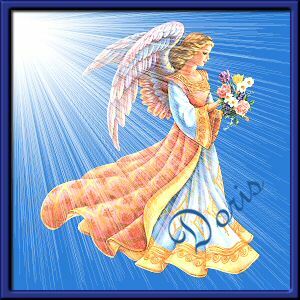 Open your Angel image. Copy it and paste as a new image. Put the original away. If necessary resize it to fit the background image you made. I made mine a width of about 220 pixels and let the smart size change the height. After you resize, sharpen. 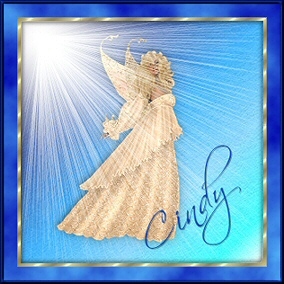 Now copy the angel and paste into the background image as a new layer. I left mine right there but you can move it wherever you want using the mover tool . If you prefer a smaller image, resize now. Create a new layer. Add a name. Use the deformation tool to change the direction of the text if you like. Add a drop shadow if you want. If you wish to add a border like mine. Use the Selection tool, rectangle and choose a 10 pixel border inside the image. Flood fill with a darker blue. Then create an inner bevel. I used these settings. Color #5A6C9A, Bevel #1, Width 1, Smoothness 10, Depth 5, Ambience 0, Shininess 80, Angle 315, Intensity 25, Elevation 40. Then I added a drop shadow....Offset Vert=2, Horiz=2, Opacity=78, Blur=3, Color=Black. Or do something of your own!